Exquisite detailing on the beautifully blown shaped bowl to the ruby color and raised hand paste detailing of the gold. A Classic design by Moser, the Glass of Kings. We have here a suite of 4 and they are in very nice antique condition. 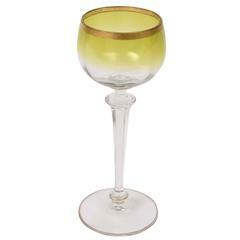 An elegant set of 12 white wine glasses with double cut knob stems and trimmed in gilt. A nice size bowl and great height. Ready to mix and match in with all your fine crystal services. Rare set of Moser wine glasses done in burgundy red and gold. Eight exquisite amethyst and gold infused Murano swan wine goblets by Salviati. Each piece is hand blown with applied gold balls and figural swan stems. The base has a 3" diameter. 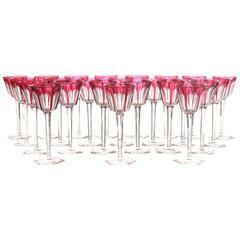 A rare set of 12 x (18 cm high) hand blown Murano wine glasses attributed to Venini. Please note that the photographs show 2 sets.